alaTest ha raccolto ed analizzato 37 recensioni su Braun 30B. La media della valutazione per questo prodotto è 4.1/5, confrontata con la media della valutazione di 4.3/5 per altri prodotti. Abbiamo analizzato differenti valutazioni di esperti ed utenti, età del prodotto ed altri elementi. 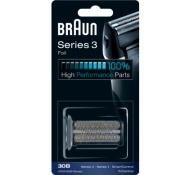 A confronto con altri prodotti, Braun 30B ha ottenuto un alaScore™ complessivo di 89/100 = qualità Molto buono. Bought this last month for my partner and he can't use it. It either misses loads of hairs or pulls them when/if it catches them instead of cutting. Would return but binned the box as expected it to be good for the money spent. Very disappointing. I have only used this once, but it left patches unshaved or slightly shaved and some parts clean shaved. I eventually started using my old one again as it wouldn't cut some hairs along the jawline. Terrible. Do not buy. Reasonable price easy to use. Not a very close shave, ok as a quick tidy up.I bought this for my husband who was not very impressed,wouldn't recommend it. Swapped from wet shave with a razor to this shaver .. excellent no irrigation and a very close shave.